A few weeks ago, I saw a ricotta cheese demo and decided to try it at home. You won't want store-bought ricotta again when you realize how easy it is to make. Anne Saxelby, of Saxelby Cheesemongers made a ricotta in front of a live audience -- and in only 20 minutes -- at the sold out "Lopate and Locavores Agrii + Culture: Cheese", which aired on WNYC. The warm, sweet and slightly lemony curds of delicious local milk taste great alone or in a recipe. 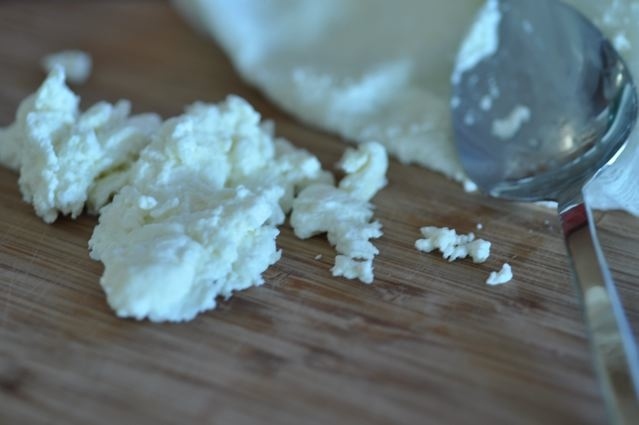 Ingredients are particularly important in cheesemaking. 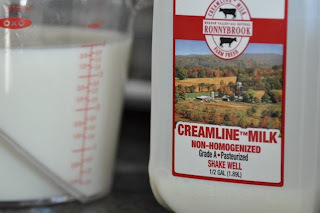 Minimally pasteurized milk works better than the ultra pasteurized brands at producing robust curds. 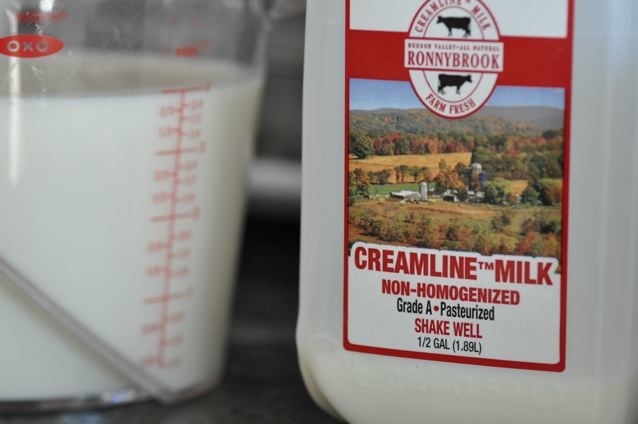 Being the locavore that I am, I chose Hudson Valley Ronnybrook Farms milk for its extra creamy cow-to- table freshness and grass-fed flavor. In a heavy pot, slowly heat the milk over medium heat to 170 degrees (F) stirring occasionally to minimize scorching on the bottom of the pan. When the temperature reaches 170 degrees stop stirring and add lemon juice -- an acidifier -- to coax the milk to curdle separating the curds that become ricotta from the liquid whey. At this stage, continue to heat the milk but do not stir as stirring will cause the curds to break. For my first effort I used lemon juice to activate the curds which is what Anne used in her demo. Other acidifiers for home chefs include buttermilk, which is way too sour for my palette, and distilled vinegar. At 190 degrees, the curds will be totally separated from the whey. Remove the pot from the heat, and using a slotted spoon, gently begin removing curds to a colander lined with cheesecloth.This cheesecloth was folded over to create four layers. 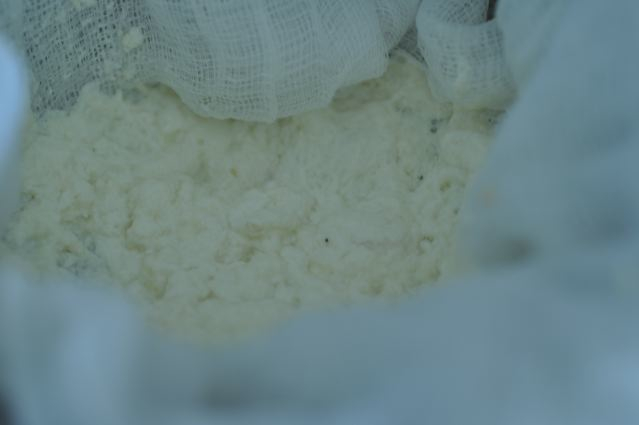 After all the curds have been removed, allow them to drain. For a creamy warm ricotta, drain 5 minutes, for a firmer but still creamy cheese, drain for 15 minutes. And for the firmest cheese, drain an hour. 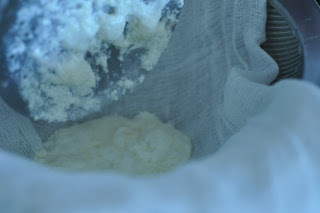 If desired, gather the edges of the cheesecloth and gently squeeze to remove any excess liquid. Serve warm or refrigerated for up to several days. In a heavy pot, heat milk to 170 degrees (F) stirring occasionally to prevent scorching. 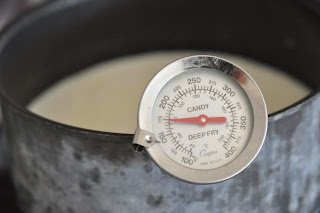 Use a candy thermometer to accurately measure the temperature. Add lemon juice, and continue to heat to 190 degrees. At this stage, do not stir or otherwise disturb the curdling process. When the milk reaches 190 degrees, remove the pot from the heat. 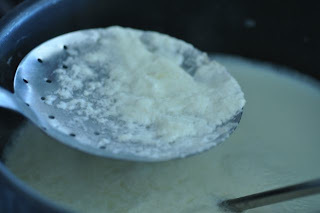 Using a slotted spoon, gently move all of the curds to a strainer that has been lined with several layers of cheesecloth and set over a bowl to catch the liquid whey. Allow the cheese to drain for at least 5 minutes and up to an hour, depending on how creamy or how firm you want the cheese. Do you think this would work with goat milk?